The two Transporter options; the bring-your-own hard drive Transporter Sync, left, and the hard drive-included Transporter tower. Mud slides, fires, hurricanes, building collapses, theft, floods, sink holes, and especially hard disk drive crashes happen and usually take irreplaceable objects and files, especially photos, both physical and digital, with them. How do you avoid a catastrophic digital file loss from one of these or other natural or unnatural disasters? Simple. Back up your computer, your smartphone and your tablet. Or, perhaps not so simply since a World Back Up Day -- observed each year on March 31 -- had to be created to nag, goad or convince us. Suggested on the World Backup Day Website are a fraction of today's myriad backup solutions. For instance, you can burn files to a CD or DVD -- just be sure to store these discs in a safe, secure location. You can copy files onto an external hard drive; I recommend a fire- , crush- and flood-proof model from ioSafe, which I own. You can subscribe to a backup cloud service a la Dropbox, SugarSync, Carbonite, Google Drive, Microsoft's OneDrive (nee SkyDrive), PogoPlug Cloud or CrashPlan (or, for Mac users, iCloud), all of which include mobile apps for remote access to your files and charge a monthly or annual fee. You can read the most current comparative reviews of many of these from CNET here, from PC Advisor here and from About.com here. 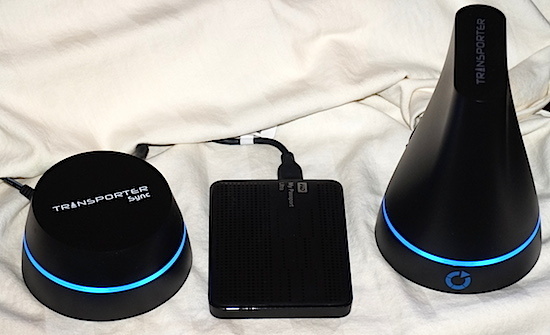 You can DIY your own cloud via a so-called Network Attached Storage (NAS) system -- you connect your own hard drive to the Internet for remote access -- such as Western Digital's My Cloud, Seagate Central or, my new favorite, Transporter, which I'll discuss more in a minute. Or, you can employ several of these backup methodologies, which is what I do -- I'm a belt-and-suspenders pack rat kinda guy, paranoid about losing anything. While we have plenty of backup options to choose from, unfortunately software makers have not awoken to our need to save files to multiple locations. But first, a bit about available backup options and Transporter. Local hard drive storage, NAS and off-site subscription cloud storage backups each present their own shortcomings and drawbacks. Local hard drive storage leaves your backup as vulnerable as your main storage, doesn't keep your files automatically synced and doesn't provide remote access. I've found NAS systems expensive, difficult to work with, and many lack drag-and-drop file copy convenience. Remote cloud services come complete with nagging (if oft illogical) distrust -- despite assurances, you have no idea how secure from hackers your files are, how safe they are from disaster, or the viability of the company. And then there's that annoying monthly or annual service fee. Transporter attempts to solve all these problems. Transporter combines many of the attributes of a local hard drive backup, a cloud-based backup service and an NAS, solving many of the aforementioned problems posed by each. And, with no monthly service fee, Transporter is cheaper than most of these other solutions. I only received my Transporter about 10 days ago so I'm still putting it through its paces, but here's a brief outline of what is and does. There are two Transporter versions: a neo-modern tower, only 6-inches tall, that includes an internal hard drive, either 500 GB ($199), 1 TB ($249) or 2 TB ($349), or, a hockey puck-like version, the Transporter Sync ($99) to which you attach your own external hard drive. All get connected via Ethernet cable to your home network, and you can download iOS or Android apps to gain remote access to your Transporter files. By doubling up, getting two Transporters, you can create both local storage and your own remote/cloud service -- just keep the second Transporter at an off-site location, such as your office. Should disaster strike one Transporter, your files are still safe on the other. Any changes made to files stored on the Transporter network are automatically synced throughout your Transporter network. You can choose to have files copied and synced to remote devices, as if the Transporter was connected directly to other PCs, or just access all the Transporter files via an Internet connection as if they were in the cloud. You can also share files, and each family member or workgroup member can get their own private Transporter library. And moving files to/from the Transporter is simple drag-and-drop, just as if it were a regular hard drive hard-wired to your PC via USB. In my limited time with it, I have yet to find a copy, backup, remote access, sync or share option Transporter doesn't address. As with all systems, there's a learning curve before you'll grok Transporter's internal logic and oodles of options. But at first blush, though, Transporter seems to solve all my document file organizational needs. But even Transporter doesn't fix a frustrating software issue -- the now antiquated single Save option. Through the years, document, presentation and photo software has adapted and changed with the time, offering greater range and increasingly sophisticated methods of editing, formatting, file type and organizational options. But document, presentation and photo software remains mummified in how files are Saved. Despite the plethora of devices we now own and multitude of backup options, most software only lets you Save to one location. I don't know about you, but backing up would be a whole lot easier if I could designate a second or even a third place to Save a particular file. One file could then be Saved to all designated locations with a single click, eliminating extra backup steps. So you World Backup Day organizers: in addition to exhorting us to backup, how about nudging software programmers to provide us with multiple Save options?